Brush bond coating is a procedure which is connected to the dividers, blocks or cement to stay away from any leakage. It is a cementations frame which is connected to the diverse surfaces to shield from water spillages. we give Brush Bond coating services in Hyderabad we provide the Brush Bond Coating Water Works in Hyderabad Dhanasree waterproofing services give the best brush bond coating waterproofing services In Hyderabad if any body want Brush Bond Coating solution in Hyderabad call us on 9700191890. 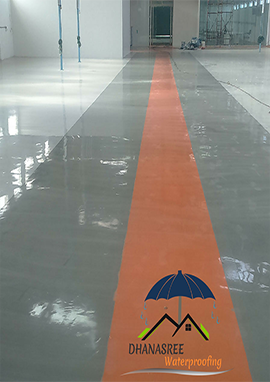 We are your specialist for durable and high-quality floor coatings, wall coatings and ceiling coatings. Whether for design areas, industry, kitchen, food production, garage or car park, clean room or animal stabling, we are sure to find the right solution for you. Excellent grip - Bonds to permeable and nonporous surfaces. Call +91 9700191890 to arrange a free inspection. Technically perfect and optically high-quality coatings are today the basis for qualitative processes in all industries. Floors, walls, ceilings are more than just a supporting surface - they are a statement of the overall quality and attitude of the company or client.